SOUTH HAVEN, MI / SOUTH BEND, IN – The qualifying races continue while leading up to Optima’s Street Car Invitational with the Motor State Challenge on July 21-23. Competitors must not only have fast, but also reliable cars to make it through a cruise Thursday, followed by road racing Friday at GingerMan Raceway, completed by the autocross on Saturday at the Tire Rack. With the hot and humid weather, the Ultimate Performance team was required to make adjustments after every run to ensure the drivers would achieve top performance on the road course and autocross. 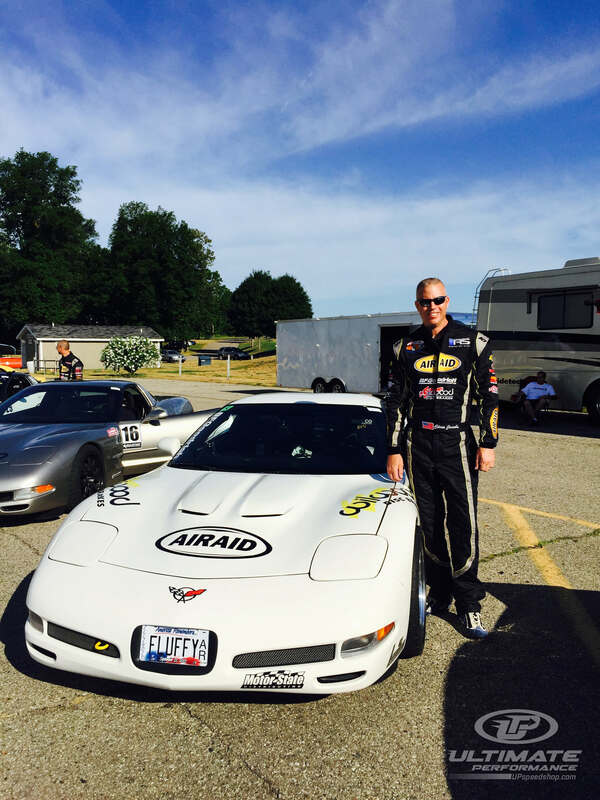 Chris Jacobs’ veteran abilities allowed him to make clean runs in his ‘02 C5 Corvette, Fluffy, to become the champion of the Late Model class while using Wilwood Brakes. With the help of his custom CMP camshaft, Chris dropped 4.8 seconds on his lap time with a 5 mph gain on the straightway landing him the fastest timed lap in the 8-year history of the event. Jim Stehlin and his ‘70 Camaro had an eventful weekend. Prior to the race, Jim had to replace a cracked steering line fitting but was able to be back on the track for the last session. Aside from a cracked fitting, this was Jim’s first race running a new setup with JRi Shocks and DSE rear sway bar and upper control arms. With his new set up, he was able to improve his time and set a personal best. Kyle Tucker and his DSE equipped ‘70 Camaro experienced issues as many with the heat. This required the UP team to adjust his JRi shocks after every run in order to maintain top performance. Through the meticulous maintenance and incredible driving ability, he was able to become the manufacturers vintage class champion and set the fastest lap at GingerMan in his class. Scott Knick was able to shave .7 of a second off of his autocross time in his ‘65 Corvette by making key suspension modifications like JRi shock adjustments, tire pressure, and rear spring rubbers. Larry Woo brought his ‘68 Camaro and unfortunately suffered an issue with a leaking steering rack, but he was able to complete his races and place second in the vintage class. With shock adjustments being mandatory at this point, JJ was able to tune the new UP Shock Valving instrument for Larry’s JRi shocks. This weekend called for paying close attention to detail for shock adjustments with the high heat and humidity. Congratulations to all of the UP drivers and their improvements and achievements.